The absorption of copper varies considerably. It is estimated that the pre-ruminant calf absorbs approx. 90% of dietary copper whereas the weaned ruminant absorbs less than 6%. 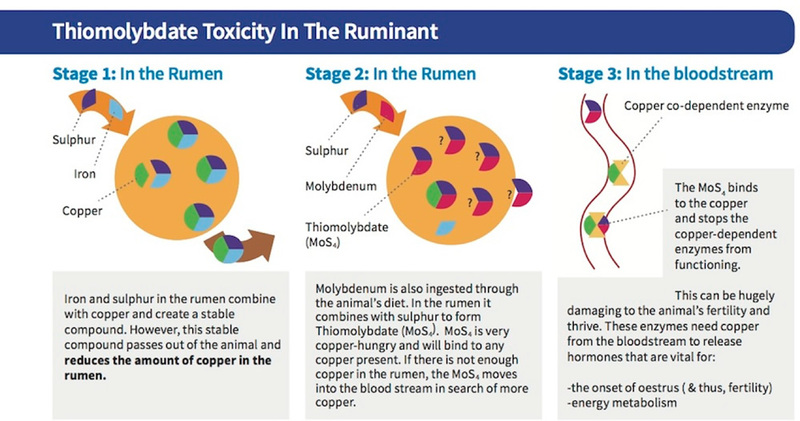 High levels of dietary sulphur and molybdenum can reduce copper absorption to as little as 1% of dietary copper intake due to the formation of copper-thiomolybdate complexes in the rumen. For copper to be bound by thiomolybdates it must be in an available form during its transit through the rumen. Therefore, for animals managed under grazing conditions likely to contribute to high thiomolybdate formation, it is important to consider the form of supplemental copper to ensure efficacy of supplementation. 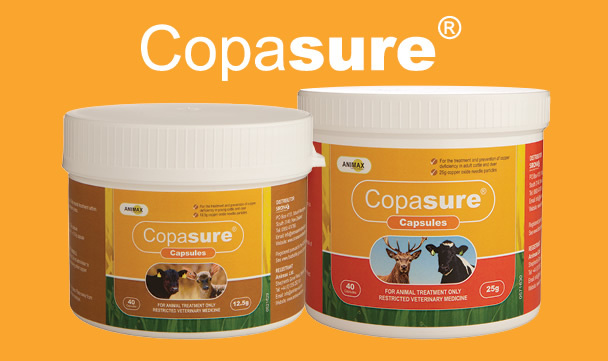 Upon entering the rumen, the gelatin capsule of the Copasure® dissolves and the copper oxide particles are released into the rumen. In the rumen these particles are insoluble and the elemental copper is unavailable to react with molybdenum and sulphur. Over the next few weeks these wire needles move slowly through the reticulum and omasum into the abomasum, where they are caught in the folds of the abomasum wall. The acidic environment in the abomasum dissolves the copper oxide coating. The hydrochloric acid in the abomasum reacts with the copper oxide to form copper chloride which can be absorbed in the abomasum and proximal duodenum. Copper released from copper oxide wire particles is NOT exposed and bound to thiomolybdates in the digestive tract as the copper is not released in a soluble form until it is out of the rumen, increasing the amount of copper available for absorption. This is one of the significant advantages of both copper oxide wire particles and copper injections – they are not bound in a reaction with sulphur and molybdenum within the rumen. Supplementation of copper is highly variable and dependent on soil types and farm systems. Consult with a veterinarian before administering Copasure®®. It is advisable to set up a continuous monitoring of copper status by measuring liver copper levels before and during supplementation.